A student in my GSCI 104: 3D Printing class built a catapult that prints in one piece! 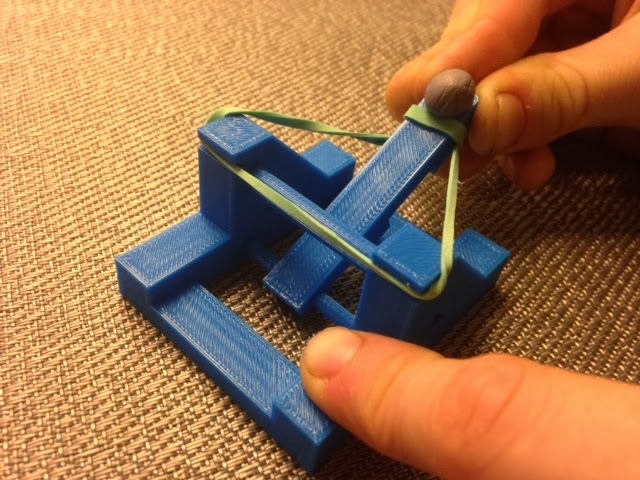 Inspired by zheng's multi-piece Seej Catapult on Thingiverse, zackowen built a new Print in Place Catapult in Tinkercad that requires no assembly. We printed it successfully with no raft or supports at all! Settings: MakerWare .3mm/low with no raft and no support. The movable piece worked perfectly with no obstruction or weaknesses. The base of the firing arm was a little bit above the platform and printed with some sagging, but it was easy to cut off the loose threads.